Multidimensional poverty measures have been gaining ground among policymakers in developing countries. They are now routinely calculated along with traditional monetary poverty measures. Recently, the Colombian government announced it would use multidimensional poverty to set the 2030 poverty reduction goal. The encompassing nature of multidimensional poverty indices is one of its main advantages. It allows policymakers to assess improvements on a wide array of household characteristics through a small set of indicators. However, this attractive feature can become a drawback when tracking the evolution of multidimensional poverty over time. A drop in monetary poverty means that income increased for some households. A drop in multidimensional poverty, however, can be due to a wide array of changes. Was it because households managed to send their kids to school? Or because a family member managed to find a job? Answering these questions requires tracking each dimension of poverty separately, quickly defeating the purpose of a single poverty measure. It may also require panel data to track households over time, which is not available in many developing country contexts. In our research with Carlos Rodriguez-Castelán, José Daniel Trujillo, and Daniel Valderrama, we develop a methodology to decompose changes in multidimensional poverty over time into contributions by dimension. We propose a methodology that can be applied in panel and repeated cross-sectional data and apply it to the recent decline in multidimensional poverty in Colombia. Multidimensional poverty analyses usually comprise three indices: the multidimensional poverty headcount (H) —which counts the number of multidimensionally poor— the average deprivation share among the poor (A) —which measures the severity of poverty— and the adjusted headcount ratio (M0), which combines both measures. We focus on the multidimensional poverty headcount for two reasons. First, because this indicator has received most attention by policymakers, as it is directly comparable to the monetary poverty rate. The second reason is that declines in the adjusted headcount ratio across developing countries are mostly due to a decreasing incidence of poverty —which is measured by the headcount—as opposed to decreases in the intensity of poverty (Apablaza et. al. 2010, Apablaza and Yalonetzky 2013). Figure 1 shows this for the Colombian context. 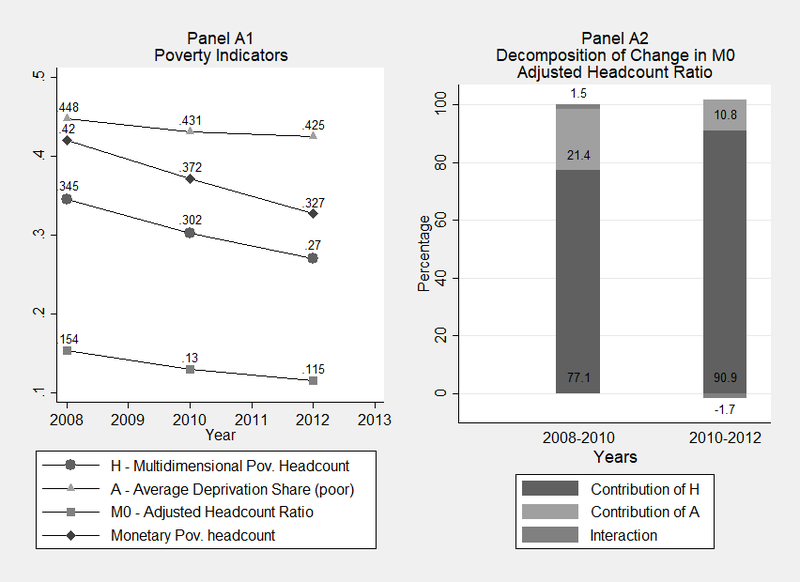 The adjusted headcount ratio declines from 0.154 to 0.115, a 23 % decrease in poverty adjusted by its intensity. This decrease is mostly driven by decreases in the multidimensional poverty headcount. The number of people who were poor decreases sharply, but the extent of poverty for those who remain poor remains relatively constant. The number of multidimensionally poor falls from 34 % in 2008 to about 27 & in 2012. From 2008 to 2010, this accounts for 77 % of the decline in the adjusted headcount ratio. From 2010 to 2012, this share increased to 90 %. The intensity of poverty remains relatively constant throughout the period. To find out which dimensions contribute more to this poverty decline, we adapt a methodology based on counterfactual simulations (Barros et. al 2006; Azevedo et al 2012, 2013a, 2013b) to the multidimensional headcount. Improvements in one dimension may bring a household below the poverty threshold but may be insufficient for other households that are deprived in many dimensions. Our methodology simulates changes dimensions one by one and tracks the counterfactual overall headcount ratio to arrive at the contribution of each dimension. We validate our methodology using a panel dataset of Colombian households, the ELCA, where we show to apply the method when it is possible to track individuals over time. We then turn to repeated cross-sectional data, the ECV, and decompose the decline in poverty between 2008 and 2012. Table 1 shows the contribution of dimensions, by category, to the overall decrease in the multidimensional poverty headcount. More than half of the decrease can be attributed to improvements in health –such as access to health insurance and health services-, and education –such as increases in years of education and literacy. Changes in employment conditions contribute little to the overall poverty decrease. We also show that the decomposition provides information about poverty dynamics that is absent from standard analyses. Censored headcounts, that is, those deprived in each dimension among the poor, do not change as drastically in the health and education dimensions. Uncensored headcounts, those deprived in each dimension in the whole sample, decline substantially in the dimensions associated with standard of living, but this is not reflected in the overall multidimensional poverty headcount. Our methodology succinctly summarizes the drivers behind the decline without tracking these sets of indicators. APABLAZA , M.; O CAMPO , J.P. and G., YALONETZKY (2010). “Decomposing Changes in Multidimensional Poverty in 10 Countries”. Mimeo, Oxford Poverty and Human Development Initiative. APABLAZA , M. and YALONETZKY , G. (2013). “Decomposing Multidimensional Poverty Dynamics”. Working Paper 101, Young Lives. AZEVEDO , JOAO PEDRO ; SANFELICE , VIVIANE and NGUYEN , MINH CONG (2012). “Shapley Decomposition by Components of a Welfare Aggregate”. Mimeo, the World Bank. AZEVEDO , JOAO PEDRO ; INCHAUSTE , GABRIELA ; OLIVIERI , SERGIO ; SAAVEDRA , JAIME and WINKLER , HERNAN (2013a). “Is Labor Income Responsible for Poverty Reduction? A Decomposition Approach”. Policy Research Working Paper 6414, The World Bank. BARROS , RICARDO ; DE CARVALHO , MIRELA ; FRANCO , SAMUEL and MENDOCA , ROSANNE (2006). “Uma Análise das Principais Causas da Queda Recente na Desigualdade de Renda Brasileira”. Revista Econômica, 8(1), pp. 117–147.